Do you take Health Insurance payments? Do you take Dental Health Services Vouchers? Absolutely. We don’t want your oral health to suffer for any reason, and we gladly accept those vouchers as payment. Yes. Sometimes teeth need procedures you may not have saved up for. We use Denticare to help you start the treatments you need, and allow you to spread the interest-free payments over time. We take pride in providing both quality and a timely service to all our clients. We hold your appointment time especially just for you, so you will receive an appropriate amount of time with us for a quality experience all around. We ask that you make every effort to give us at least a 24-hour notice if you cannot make your scheduled appointment. If you do not show for your appointment or do not give us adequate cancellation notice, we are not given the opportunity to reschedule that time with another patient who has a true dental need. In the event that no notice or less than 24 hours notice is given, we may charge a cancellation fee. Please note insurance benefits DO NOT cover fees for broken appointments; payment is then the patient’s responsibility. Invisalign is similar to traditional braces, in that it’s a method of straightening teeth. Unlike braces, Invisalign uses clear, removable plastic tray-like aligners that have been custom-made to fit over your teeth. The aligners are changed every 2 weeks to gradually move your teeth into the desired position. As well as Invisalign, we offer traditional braces to move teeth and improve a person’s bite as needed. Each system has advantages and disadvantages over the other; talk with your dentist to explore which system may suit your lifestyle and your budget best. How can a dentist help with snoring? Snoring may be a sign of blocked or partially blocked airways when you sleep. It can be a sign of Sleep Apnea, which can lead to serious long-term health issues. 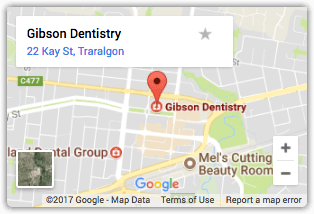 We work with Gippsland Sleep Centre, a local businesses, to help determine the cause and best treatments for helping reduce the severity and frequency of snoring. Read more on our > Snoring & Sleep Apnea information page.